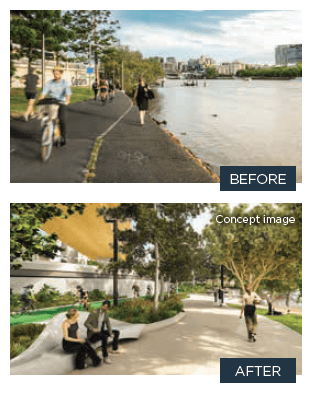 From Monday 16 July 2018 to mid-2019 the Bicentennial Bikeway from near the Goodwill Bridge to the back of 1 William Street will be under construction. The highlighted section of the Bicentennial Bikeway (see map on left) will soon be under construction. An alternative route will be offered for the duration of the work with details still being finalised. For more information visit our website www.queenswharfbrisbane.com.au.